Harris’s Hawk breeders are using the Baywing Database to produce better falconry birds, thus improving the quality of falconry for all Harris’s hawkers. 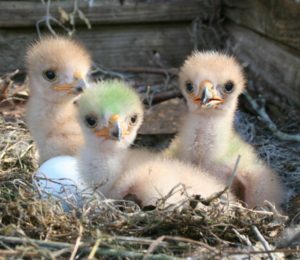 Breeders: Providing pedigrees for your hawks means customer satisfaction. The new age falconer is savvy about the benefits of selective breeding. Show your customers that you are part of the selective breeding movement by providing pedigreed hawks! You will be able to track the performance of the hawks you’ve bred. You will be able to determine the relationship of new breeding stock to your current program and to the programs of other breeders. You can look up the Coefficient of Inbreeding for the offspring you produce. Let the Baywing Database curate your breeding records for you! Falconers: The database will help you find a breeder and perhaps a particular pair of birds which produce the kind of offspring you’d like to fly. You can find out how the relatives of your hunting birds are performing for other falconers around the world. And, as a bonus for entering your hawk’s information in Baywing Database, consider the fact that several lost Harris’s Hawks have been returned to their falconers because the hawk’s band number and owner’s name are in the database! Geneticist, Toby Bradshaw, hunts with a cast of Harris’s Hawks that he selectively bred. He created the Baywing Database in April of 1999 and curated it for the first 16 years of its existence. Raptor ecologist, Jennifer Coulson, hunts with her husband, Tom, and a group of their selectively bred Harris’s Hawks. She became the Baywing Database curator in November of 2015. A proud sponsor of the Baywing Database, NAFA provided a small grant which funded this user-friendly website, with search options and pedigree-generating capabilities. This web platform is capable of hosting databases for additional falconry species. Contact Jennifer for more information.